As for my first post here on the forums I'm posting my first map ever made with Radiant. This map went through 3 games: First, I made it for Doom then I remade it from scratch for Q3 (since they're not cross-compatible) then ported it over to Xonotic. I made it for learning purposes. It's not quite easy to get into true 3D design especially after Doom. There will be more to come after I finish optimizing this map since it's performance is quite poor, and I'm not good at optimization yet so I'd appreciate any advices on how to do it properly. Another problem: the water pool in the open area is not done properly. It consists of two brushes, and where they connect, the face of their sides also gets rendered and I don't know how to fix it as I tried lots of solutions: caulk, nodraw, etc. In Q3 it worked with caulk but I know it's a different engine. Enough of talking, let's see the screenshots, shall we? If you create a water/lava pool consisting of different brushes, then using caulk for all sides (except top) should work fine. Another option might be using "nodraw nonsolid". You need to add a .mapinfo file and obey the requried file/folder structure. You can check http://beta.xonotic.org/autobuild-bsp/ for correctly packed pk3 files. I see a potential TDM map! Might have a bit too many 50hps though. Looks very fancy, nice work! There are shaders in the common folder for slimenodraw and lavanodraw, they're useful for the sides of such brushes. (02-18-2016, 12:56 PM)Smilecythe Wrote: I see a potential TDM map! I balanced it a little bit, removed most of the 50hps and put the remaining ones in more appropriate places. (02-18-2016, 09:21 PM)Mario Wrote: Looks very fancy, nice work! The waternodraw worked actually but only when I applied it to all faces except the top. At first I only applied it for the face which connects. Thanks! I achieved a little optimization for it but it can't be determined if I only test it on my pc. I also packed it in a pk3 properly. I knew actually how to do it but I didn't want to until I finished it. Woops, thank you for the spotting. Nice looking map. Hope we can give it a run soon. I'll do a video walkthrough as soon as I can. Thanks for the map, FractalXX! well done - thankies for your affort. Maps playable on Prophets Server (Duel/DM). Your PK3 is fine, you could just add a radar minimap (/gfx/fx-techdamn_mini.tga). (02-20-2016, 05:20 AM)SpiKe! Wrote: Looks great! Will do it once I get to my PC. Creative usage of geometry, I must say. 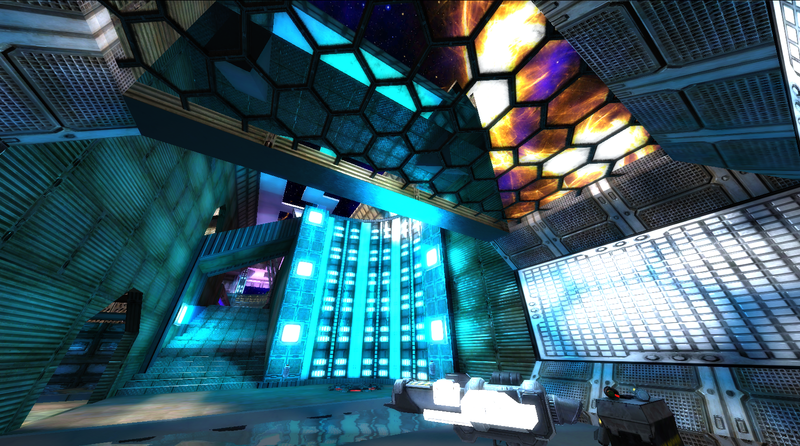 I guess I should clip those windows at the outside, and fix the clipping at where the neon lights are. When I clipped the top of the map, the end of the clip brush got hung in there. I also have an idea so you won't get stuck behind the teleport. You need to add some suffix to the pk3- and filenames (r1, r2 / v1, v2 whatever) if you make changes to your map. Otherwise people with an old version will have trouble, because they won't download the new versions since they have the same name. (02-22-2016, 12:10 AM)Mirio Wrote: You need to add some suffix to the pk3- and filenames (r1, r2 / v1, v2 whatever) if you make changes to your map. Otherwise people with an old version will have trouble, because they won't download the new versions since they have the same name. Are you still working on this? I'm hosting your v2 on bfg pickup server. I've been quite busy by work so I couldn't do any improvements recently. If you point out anything that needs to be improved feel free to share. Optimization is a little more complicated though. When I first built this for Q3 long ago, I didn't have any experience on brushwork so this should be rebuilt from scratch to run better which is kind of hard. Is there a way to download this map without being forced to make an account at sendspace? Is this map still available for download somewhere? I've just downloaded the file.Thanks a lot! Going to play it this evening with a friend of mine.